I will be starting my camino from SJPP on june the 10th. Ive been doing a lot of reading, training, and researching. One of the question i had was on food. For those that have walked el camino, what did you do about breakfast, lunch and dinner? I hear most people eat breakfast and dinner at the albuergues. Are there other options? How do you handle lunch? Do you pack a lunch and snack? Will there be places to stop for lunch along the way? And finally, are there lots of water fountains along the way? I do have a water pouch but also wanted to know if there was going to be water available along el camino. I am very forgetful and will probably forget my water pouch at some point haha! Hi - lot of questions there - don't be afraid, day by day you will know what is coming up on the next stage. Some days are dry and some aren't - you will know by asking the evening before. ... and that is the thing - learning not to care about what is next, it will rise up and meet you anyway. - also, the cost adds up, so if you are on a budget - it IS a pilgrimage after all - well, you can carry a pack of pasta - add that to water at the refugio, olive oil, salt and pepper and some of your cheese and sausage and you have a fantastic meal for the cost of a coffee or two. My only advice is never pass an opportunity for a cafe con leche or a tortilla Frances. The next listed bar or cafe in your guide book may be shut when you get there. Carry water always. Food: unless you have metabolic issues; trust the Camino to provide - there is always a bar / meson or tienda that will provide some fuel. Sources suggest that the human body can survive without food for for fifty days but without water for fifty hours. Agree with that, except for the coffee - you get used to that caffeine hit, it seems a normal thing to do, but every time you get that caffeine hit your adrenal glands secrete - makes you feel good. But an hour or so later your energy levels are lower than before the hit .. it is a real drug .. eventually (years) your adrenal glands are exhausted, and then so are you and the caffeine hit only makes your mind go fast, your body has had it. Try giving up caffeine and watch - irritability, afternoon exhaustion for days and days - until your adrenal glands, rested now, repair - and then you become pretty cool. One thing about carrying a small amount of your own food supplies (and not being addicted to caffeine) is that you no longer think about 'when is the next cafe', you no longer have to look ahead, you no longer have to worry - you are independent, you are free (to some extent). Your thing about being nervous, wanting to work it all out, to be prepared - ah - but there you are - you have two minds, the chattering mind which demands certainty and is terrified of the unknown, and your real mind, the silent observer, that knows that all is well and all has always been well, and is not afraid. This nervousness before Camino is completely normal, this trying to prepare for the unknown and not being able to is completely normal too. Remember that first day at senior school? Your first date? Your first job? Remember the days before those events and your chattering mind going on and on and on? Exactly! - waste of time. All will be well - let your chattering mind chatter on, go sit quietly somewhere and watch calmly from your other mind - you have survived this planet pretty well so far, you will be fine, all will be fine - all, already, is fine. As the wise man of the mountains said to the pilgrim, "OOwungalema"
There is a small village every 4 or 5 km, and a bigger village or town every 20 to 25 kms. When I did it in 2004, not every village had a cafe, bar or albergue. But now they are everywhere. No problems finding food or water. I found always having an extra litre of water good because you cannot be certain where the next fountain is. Or when you will come across a pilgrim who had way too much wine the night before and is desparately dehydrated. I also carried a tent, cot, air mattress, stove, waterfilter, insect repellent, spare boots, 7 underpants and 7 pairs of socks so that I only had to do laundry once a week. You can find anything your heart desires... A gypsy from Romania will tell your fortune or read your tarot cards. A hippie from Amsterdam will have 3 kinds of pot for you to try. A nymphomaniac from Paris will... well, you know! I always had a little bag of pitted dates, rasins, nuts... good energy food when you find yourself getting tired. In Spain, they call this stuff "Fruitas Seco" or something like that. If you don't know the word, just point and grunt. They are use to rude pilgrims. And the pilgrim replied to the old man of the mountain, "NOw-wellygambelameala." ... what did you do about breakfast, lunch and dinner? Breakfast - some albergues do offer breakfast, if not I just shopped the day before for something to eat in the morning. Lunch - either in a bar (bocadillo = baguette with different fillings) or a picknick, normally shopped also the day before. Dinner - either cooking together with other pilgrims in the albergue, if possible, or a pilgrim menu in a bar or restaurant. Shops - There are plenty of shops, basically every village has at least one, but bear in mind that these small shops do NOT accept cards, only cash. A good travel guide will tell you where ATMs can be found and where not. Water - Plenty of fountains around (potable=drinkable / no potable = not drinkable), but the water has a lot of chlorine in it, but one get used to that taste ;-) Also here a good Camino Guide will warn you when there are longer stretches without water source. When walking alone in late autumn and winter breakfast and a big late lunch are my norm with periodic bar stops throughout the walking day for coffee, hot chocolate or fresh orange juice and the loo. In Léon hot chocolate is so thick that the spoon almost stands in the cup. Served with freshly made crullers it is a delicious, caloric treat and fuel for trekking! For a delicious pick-up try freshly squeezed zumo naranja or orange juice. No champagne has ever tasted better! In those albergues which offer kitchens many pilgrims for either dietary reasons and/or to cut costs prepare their own meals; except in emergencies I generally don't. However we all realize that today's food provides the fuel necessary for tomorrow's walking. Furthermore BASIC RATIONS are always carried since the only shop or bar in town may NOT be open! My basics include tea bags, packets which make a cup of soup (even including croutons ! ), firm cheese, small sausage, simple cookies and some chocolate. Often these same ingredients serve as a predawn breakfast hours before any Spanish bar would dream of opening! Some hospitaleros provide delicious dinners; communal meals at Granon and Ruitelan have always been memorable feasts. Generally for lunch or dinner many places along the way offer a standard three course Peregrino Menu (Pilgrim Menu) for 8€ or 9€. Although edible these often are only basic courses. A better alternative is the Menu de Dia (Daily Menu) which costs a bit more but provides much better quality and choice. You can find anything your heart desires... A gypsy from Romania will tell your fortune or read your tarot cards. A hippie from Amsterdam will have 3 kinds of pot for you to try. A nymphomaniac from Paris will... well, you know." For those that have walked el camino, what did you do about breakfast, lunch and dinner? One of the most pleasant surprises I got while walking the Camino was how little you really need to eat to get by and how you learn to listen to your body when its telling you to refueled (or not!). The idea of always having a snack with you is good advice. Do remember to stock with some food the night before, mots critical if starting from SJPDP; do it before markets close. I bought fruits, nuts and bread. The fruits were heavy; only one would had suffice. Orisson has some limited snacks, but it is a nice break. After Orisson you are on God's Good Humor when it comes to food ! I learned to appreciate an open market and even more a freshly baked pastry and a potable water fountain. They are available often, but sometimes your timing and theirs do not synchronize. That's when having a snack handy till the next town becomes often a lifesaver. I also learned to check for fruit markets later on the day. Prices were cheaper an I was able to buy more to share. Buen Camino. I am heading back on May 16th and am already beside myself with anticipation! I couldn't bear the thought of adding to my pack weight by carrying anything more than snacks. I'd have a packet of museli bars of which I'd eat one each day for breakfast along with a piece of fruit or two bought the night before. I found that there was a distinct lack of vegetables, either in meals or in the shops. I'd hoped to supplement my meals by eating carrots or beans or cucumbers etc on their own but never really found any that looked edible so I did feel that my eating there was overly carb based...and I'm not usually someone who worries about that much! I also drank probably half of Spain's supply of Kas Limon or Naranja!! LOVE that stuff! I too worried about such things before I left and thought "it's all find and good for you all to say, play it by ear" but really, cover yourself for water, the rest play it by ear! Except on Sundays...on Sundays be sure to have bought something for your pack as a backup becuase most things are shut, or will be by the time you arrive if you wait till the end of the day. Food is only really problematic if you're walking alone -- when you're walking in company, it becomes possible to share out the weight of supplies and cook for yourselves along the way. When I was a child, in the early 50's in England, the children's adventure films always seemed to involve four of five well spoken boys and girls who were on summer in the country and would get onto a bomb plot or spy plot and get into all sorts of scrapes. Somewhere in the film there would always be an elegant tramp, a 'gentleman of the road' in an old black suit with a colourful waist coat and a battered top hat. They would find him sitting with his back to a hedgerow, looking out over a field and a marvellous view beyond. He would be having lunch, a large spotted neckerchief spread out over his lap, with bread, cheese, sausage, and an old sharp opened clasp knife. At his feet would be a bottle of brown ale. Sometimes there was a scruffy dog. When I hiked before, I carried nuts and some Cliff Bars for emergency foods. I think we ended up bringing/leaving all of the Bars as we did not need them. We tried to buy bread and cheese, maybe a piece of fruit the afternoon/night before to eat in the morning and for lunch. Stopping to have coffee along the way and maybe a pastry seemed a good break. I agree totally with--carrying a little food, definitely water; knowing that there is going to be food along the way; that there is very little by way of snacking veggies and an abundance of carbs! I liked cooking in the albergues since the meals for dinner in the small towns got tiresome, though I liked the comeraderie of walking through a small town and seeing people I had seen before on the road. Eating dinner with fellow pilgrims and having a drink was fun. Buen Camino! That's exactly what we like to do, David. Take a rest under a tree. Spread our poncho (sorry, no large spotted neckerchief) on the ground, enjoy our cheese, chorizo, some fruit and, of course fresh bread and watch the other Pilgrims passing by! 'Loving this discussion about food and water on the Camino! So helpful too, apart from one comment regarding Parisian pilgrims which definitely was not. Veteran Poster David's imagery of BYO lunches ('bring your own' as we say in Oz) definitely has me packing one of my Mum's circa-1950's cloth napkins for my next Camino - July 2014. Buen Camino 'D' - keep posting! The choice of napkin/neckerchief is of the upmost importance. It should be largish, brightly coloured, light, and when spread out on the ground it should imply that a bright, footloose and happy person, who enjoys lunching in the great outdoors is currently dining at this 5 star Michelin star restaurant! My particular favourite is a bright red one emblazoned with the image of, you guessed it, Ernesto "Che" Guevara. "Che" also gets dunked in fountains and then either worn as a neckerchief or plonked under my hat from where he imparts cooling to my addled brain. Hi Gerard - the 'Che' napkin/neckerchief sounds so cool! Since reading all the posts on this topic yesterday I've now dug out the retro napkin/neckerchief made in the 50's by Mum (red and white gingham check - very 'Stepford Wives'! but gorgeous nonetheless) and it's on the packing list for next year. For breakfast I carried a box of muesli and had a bowl mixed with a cup of yogurt purchased the night before. I carried a box of tea bags and had a cup with breakfast except in those albergues where it was not possible to get hot water. Some mornings I had to settle for a coke to get my caffeine kickstart. I carried a loaf of bread and had cheese or sausage for lunches. I could not find peanut butter. When the weather got cold and wet I started buying a hot sandwich for lunch at a bar. There were more bars per kilometer as I got closer to Santiago. Supper was Menu Perigrino at the local restaurant. It is best to find other pilgrims to go out with. The three course meal and wine was much better than anything I can make, particularly after a long day on the road. The albergues had cooking facilities. Its pleasant to share a cooked meal with fellow pilgrims but facilities were usually quite limited and the cleanliness of dishes not always spectacular. I carried a package of soup for several days in the event that I would end up in a place where food was not available but that never happened. Stores are well stocked even if some are too small to have a lot of variety. All stores are CLOSED from Saturday afternoon till Monday morning. This is also true for holidays and Spain has a lot of holidays. If you rely on groceries stock up. Tap water is safe. There is usually a fountain every few kilometers though these are not always gauranteed to be potable. Water in rural areas usually tasted MUCH better than that in cities. Spain has that nasty modern trend of selling water in plastic bottles which end up littering the countryside. Just cuz someone else left one there doesn't make it alright for you to do so too. I leave in 3 weeks, and this was just what I needed to hear. Thank you. I was sitting in a bar on the Via de la Plata, gratefully sipping my very welcome cafe con leche in company with 2 other peregrinos, when Ismael from Brazil made the solemn statement that " Cafe con leches are the gasoline of the camino". Marc [from Barcelona] and I, equally gravely, nodded our full agreement. We just finished our walk from Leon to Santiago on May 16. During the first week, most of the bars did not open until 8AM or later, and we were already on the road. We would eat breakfast at bars along the trail. During the last week, most of the bars were open around 6AM, so we could eat before starting to walk. The basic breakfast is a croissant. So you will run into bars all along the trail where you can eat breakfast or lunch. We had trouble finding potable water anywhere along the trail. Most people would buy bottled water in the bars. Are there microwaves at some of them or just the basic stove range combo? Alan, a moment of Camino clarity. Forever to be seared into your mind. Maybe I am a bit odd, I don't drink coffee, I drink tea but only when I finish walk for the day, 25/28 km. I eat fruit nuts etc, no bread, white bread to me poison. Lots of potable on camino. I never bought bottled water, I get my main meal afternoon, menu del dei.never menu peregrine , also always where locals eat, don't follow the herd and you will love your camino, go n' eiri an bother leat..
Hi. Just came back 3 weeks ago from Camino Frances. 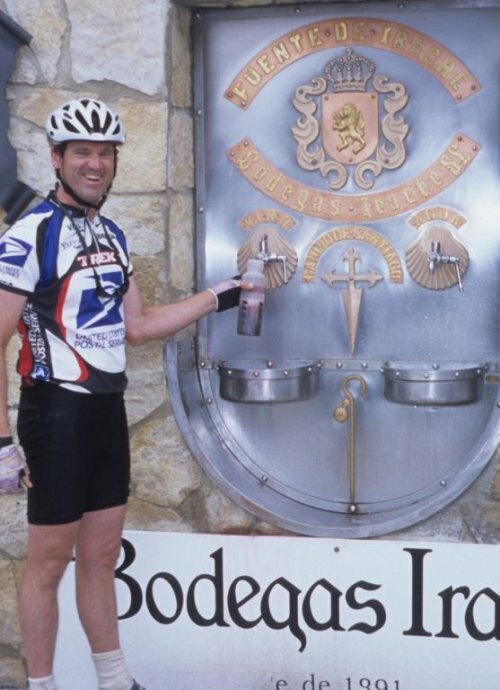 What an amazing, scarey, exhilerating, enlightening time.... but enough of that: WATER SUPPLY ON CAMINO FRANCES. Especially if you're starting in France - NO!! There is not a lot of potable water, not enough to trust the source will always be there. Admittedly - I drink A LOT (at least 3 litres/day), but it was my first scarey disappointment - particularly climbing to Roncesvalles. After that, there are lots of fountains, but at least a 3rd of them were 'not pottable'. Especially when you were really thirsty. Take a camelback. We finished our walk from Leon to Santiago on May 17, 2013. We were normally on the road by 7am. The first week there were no bars open at that time, so there was no place to eat breakfast. However, you pass through several small towns each day and can stop for a late breakfast or lunch there. The second week, in Galicia, bars were open early morning and you could get breakfast before you left. We tended to eat bananas and chocolate for lunch each day. As far as water on the trail, it was not as available as we had been told. In addition, I got diarrhea about 5 days into the hike, and began drinking bottled water. That seemed to help. I'm confident enough about the water supplies that I frequently carry red wine in my bike bottle. (especially after the fuente del vino). I never touch coffee however. Did you really carry all of that?!? If so, holy moly, how heavy was your pack? And here I am stressing out about bringing two pairs or pants AND a pair of shorts! Food Question - Memories of the Rice Cooker debate!